Home gardening and landscaping are enjoyable hobbies for many people in North Carolina. If you are among them, you might benefit from a small backyard greenhouse. A greenhouse can be built easily and inexpensively in several hours using simple hand tools and materials available at most building supply stores. This publication presents plans and instructions for an easily constructed greenhouse that costs about $100 and may be used for many purposes. Measuring 12 feet by 14 feet (168 square feet), it is small enough to be unobtrusive but large enough to meet the needs of the serious grower. Choose a level, well-drained plot for the greenhouse. If it will be used primarily for plant propagation in the summer, place it in partial shade to minimize heat buildup. A good location is the north side of a large, deciduous tree. If a partially shaded site is not available, you can use a shade cloth or a white plastic cover to control the amount of sunlight reaching the interior. If the greenhouse will be used for starting transplants or growing plants to maturity, it will need maximum exposure to the sun. It should also be located where air drainage is good; avoid low areas surrounded by woods or buildings. Easy access to running water and electricity is also important. 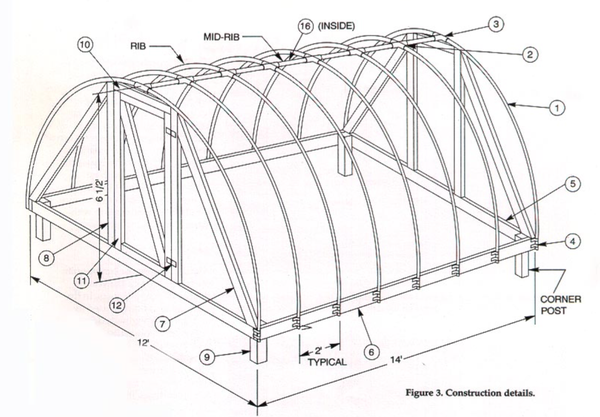 The greenhouse consists of a wooden frame to which are attached bows of polyvinyl chloride (PVC) pipe. The bows hold up the clear plastic film covering, as shown in Figure 1, Figure 2 and Figure 3. All lumber for construction should be treated for ground contact with an environmentally safe preservative such as CCA. Avoid wood preserved with chemicals such as pentachlorophenol or creosote. Lumber treated for ground contact has a higher concentration of preservative and therefore will last much longer than untreated or lightly treated wood. Except for the covering, the structure should last 10 to 12 years. Unless the site is very flat, you will need to level the foundation boards. This is best done by digging a trench on the high side instead of raising the low side, as the foundation boards should contact the ground at all points to ensure a good seal. To keep rainwater out, however, the top of the foundation board should not be below ground level, particularly around the door. The purpose of the 4-inch by 4-inch posts at each corner is to anchor the greenhouse and prevent it from moving in high winds. 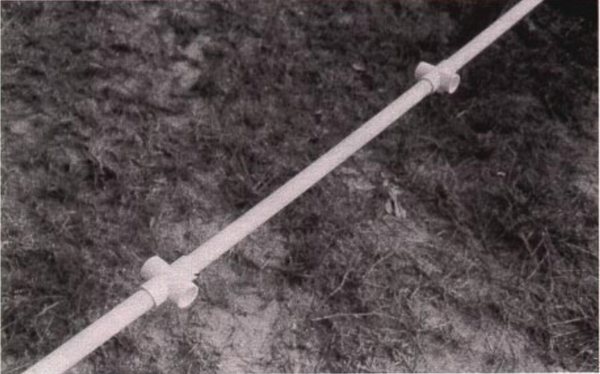 The PVC pipe bows are attached to the side boards of the foundation with electric metallic tubing (EMT) clamps (Figure 4). It is best to attach the clamps loosely to the side boards with wood screws before you secure the side board to the end boards and corner blocks. They may be tightened after the PVC pipe has been slipped into place. PVC pipe may be purchased in 10- or 20-foot lengths in either schedule 40 or schedule 80 weights. Schedule 80 PVC pipe has a thicker wall and is stronger than schedule 40 pipe. It is therefore recommended for greenhouse construction. 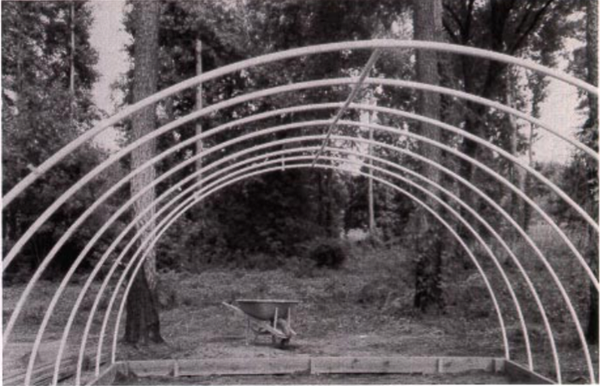 The 12-foot width of the greenhouse was chosen so that each half rib section of pipe is 10 feet long. PVC pipe may be easily cut with a hand saw although a neater cut can be made with a pipe-cutting tool specifically designed for that purpose. Care must be taken during assembly because the cement used to fasten PVC is fast-acting and permanent. It should not be used when the temperature is below 50°F. Check the directions on the can. It is best to lay all parts out on a flat surface for assembly. For the ribs to be 2 feet apart, the mid-rib pipe must be cut into pieces about 221⁄2 inches long (Figure 3 and Figure 5). After all joints have been cemented and allowed to harden for a few minutes, position the entire assembly over the foundation boards, bend the ribs, and secure them in place with the EMT clamps. Assembly is best done by two or more people to prevent overstressing the cemented joints. Ten feet of galvanized EMT positioned inside the mid-rib will give added strength to the structure. After all the PVC ribs have been secured, the end frames and door may be constructed. Although there is a door on only one end, both end frames are essentially the same. The two diagonals on each end give strength to the structure and make it easy to secure the cover. The top of the end frame may be fastened to the end ribs with either a wood screw or a small sheet metal strip bent into a U-shape. 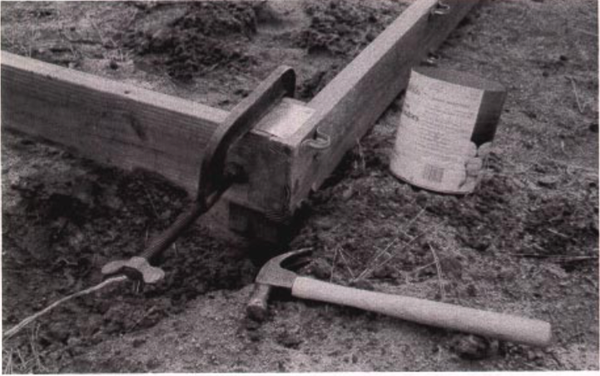 If wood screws are used, the PVC pipe must be predrilled to prevent splitting. Select the type of cover material according to the intended use of the greenhouse. Clear 4- or 6-mil plastic greenhouse film is generally best if the house will be used for growing plants. If it will be used exclusively for propagating or overwintering plants, consider using 4- or 6-mil milky or white copolymer film. White copolymer film reduces the amount of heat and light within the house and therefore limits fluctuations in these factors, keeping conditions more nearly constant during propagation or over the winter. However, shading clear plastic with a 30 to 50 percent polypropylene shade cloth or greenhouse whitewash available from horticultural supply companies will produce nearly the same effect. The cover may be attached with small tacks, but staples are much faster and more secure. Allow the cover to extend several inches past the bottom of the foundation boards, and cover the extra material with packed soil to prevent the entrance of moles and rainwater. An inch of coarse sand or fine gravel on the floor will reduce problems with mud and weeds. Figure 1. A backyard greenhouse constructed from inexpensive materials. Figure 2. Bows of PVC pipe are used to hold up the plastic film covering. Figure 4. Foundation side and end boards are attached to 4-by-4 posts to anchor the structure. Note the EMT clamps on the side boards hold the PVC pipe ribs. Figure 5. The mid-rib pipe is cut into sections about 22 1/2 inches long and rejoined with PVC crosses to which the ribs are attached. Ten feet of EMT is placed inside the mid-rib for strength. It is essential that the house be as tight as possible so that it will retain both heat and humidity. Problems with overheating can usually be solved by simply opening the door. Supplemental heat can be provided if needed during very cold weather or at night by one or more heat lamps or a small electric heater. Any electrical devices used in the damp environment of a greenhouse should be connected only to a circuit equipped with an approved ground fault current interrupter (GFCI) outlet or circuit breaker. Other sources of heat can be used, but even very small gas or oil heaters will usually overheat a greenhouse this small and may not burn well if not properly ventilated. The greenhouse will satisfactorily support up to 4 inches of dry snow. If the snow is deeper or unusually wet, one or more temporary supports should be provided along the mid-rib to precent collapse. 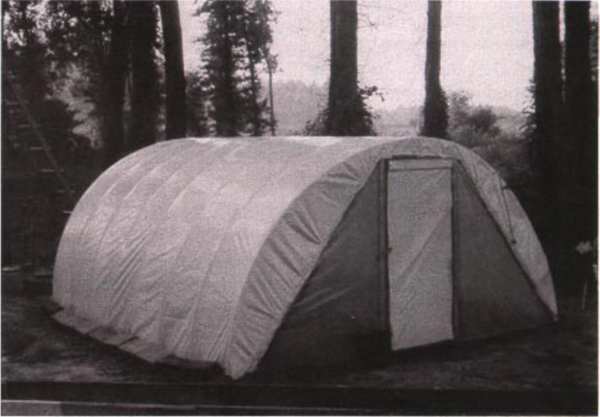 If a larger greenhouse is required, the length may be increased. Do not increase the width of the house without increasing the size of the ribs. Doing so would seriously reduce the ability of the house to withstand snow and wind loads. A small greenhouse can be quite useful throughout the year for many different purposes. In the early spring, it can be used to germinate and grow bedding and vegetable plants earlier than would otherwise be possible. In the summer, it can be used either with or without a mist system or humidifier as a propagation house to root cuttings. It can be used in the fall to start winter vegetable plants. During the winter, it can protect patio plants and other hardy but containerized woody plants.